Giving Day placed a strong emphasis on fun as well as generosity. Participants did not hesitate to cut loose and accessorize with Sammy the Slug-related fashion accessories. UC Santa Cruz received more than 3,000 gifts that will provide $340,000 in support for 65 deserving projects all across campus on its first-ever Giving Day on May 11. Projects ranged from renovating the Quarry Amphitheater to graduate student internships to a childhood cancer initiative. All 10 colleges had projects, as did divisions, athletics, faculty and staff, and many others. Generous donors provided matching funds on projects close to their hearts, as well as "challenge" bonuses for projects with the most donors during certain hours. All donors, including those who made on-the-spot micro-donations, were welcomed and appreciated. “A hundred pennies makes a dollar!” one young fundraiser called out to a group of passing students on campus, who were invited to spin a wheel, win prizes, and dine on cupcakes at Giving Day "pop-up parties" while considering their donation options. Gifts came in the thousands of dollars to the tens. No gift was considered too small—and the impact of the sum total was felt all across campus. As of the official end of Giving Day, just before the clock struck midnight on May 11, the official tally was $339,276. But the gift-giving took place at such a high volume, and so late in the game, that the final figures are still being calculated. 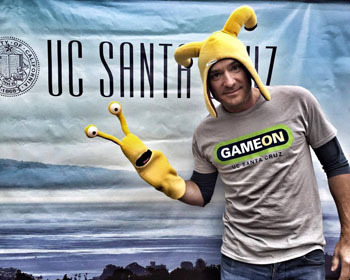 Giving Day, with the motto “Game on, Give on!,” unfolded in real time, much like a spirited basketball game or heated political race. The action took place second by second, and a watchful “audience” of online viewers could see it all at a highly interactive web page that is being updated even now. The numbers changed so rapidly that the latest, greatest figure could become "old news" in a heartbeat. “It’s like election night,” remarked Keith Brant, UC Santa Cruz’s vice chancellor of University Relations. “I’m watching the returns. I’ve been watching this since midnight … What’s exciting is all the work that has gone into it from all corners of the campus— all the projects, all the people,” Brant said. The campus got the word out far and wide on video and social media, as well as an event page on Facebook, which gave donors and project supporters a venue to express their gratitude within seconds after receiving gift commitments. “Woohoo! $2,855 had been donated to the Silver Slug Award staff scholarship when I checked a few moments ago,” proclaimed Mary Wells of the UC Santa Cruz Retirees Association. The award will be given to current and retired staff and their dependents studying at UC Santa Cruz who need financial assistance. Wells and two fellow donors, Dave Kirk and Sharon Dirnberger, provided a 1:1 match up to $6,500 for gifts made on Giving Day. The playing field was any place where a donor could get a WiFi connection. And yet the emotional focus of Giving Day was the UC Santa Cruz campus, where fundraisers staged “pop-up parties” at Quarry Plaza, McHenry Library, and other locations. Later, the action moved to downtown Santa Cruz, where Mission Hill Creamery owner David Kumec (College Eight '91, economics) served up specially made “Banana Slug" ice cream and the trendy Lúpulo Craft Beer House had a Giving Day-themed evening bash. Up at Quarry Plaza on campus, an enthusiastic crowd gathered on Wednesday morning, including UC Santa Cruz Campus Provost and Executive Vice Chancellor Alison Galloway. By noon, the donations were already edging close to $200,000. For many students, Giving Day was the chance to become philanthropists for the first time ever. The specific amount was not the point. Some students made on-the-spot contributions, pooling loose change, turning jeans pockets inside out. All the gift givers came away smiling after having a chance to spin the wheel to win a Sammy sticker, a T-shirt, or a temporary Sammy tattoo. 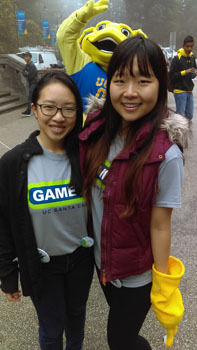 Esther Hu and Kianna Mark, both 19, were at the plaza, braving the drizzle and dancing with a shamelessly photo-bombing Sammy the Slug. They were raising funds for the Haluan Hip-Hop Dance Troupe, which hosts an annual urban dance showcase called En Route. Giving Day was also a chance for students to express their concerns, their vision, and their campus priorities. Sami Chen (Kresge '16, Earth sciences) made an on-the-spot donation to Girls In Engineering, a 5-day summer camp that invites middle school girls from underserved communities to campus to learn about computer science and engineering topics through fun activities, and to explore STEM (science, technology, engineering, and mathematics) academic and career pathways. “I think women in all STEM fields are definitely underrepresented,” Chen noted. On Giving Day, Chen’s gift was among 79 that added $21,860 in resources to Girls in Engineering.